The crowd was a little sparse Wednesday morning as early voting began in Ohio. 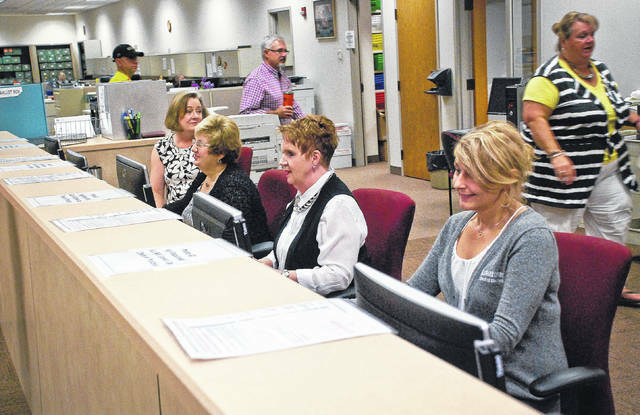 The Delaware County Board of Elections’ staff, from left, Elizabeth Day, Mary Pat Helvey, Barb Berry, and Shirley Bennehoof waited on those who did take advantage of the remodaled voting facility at the board building. Early voting started Oct.11 in Ohio for the Nov. 7 election. Registered voters can now vote by absentee ballot or in person at the Delaware County Board of Elections’ Vote Center, 2079 U.S. Highway 23N, Delaware. The center is open Monday through Friday between the hours of 8 a.m. and 5 p.m. The board has scheduled extended hours for the center. Following is the schedule: Oct. 30 to Nov.3, 8 a.m. to 7 p.m. with additional hours on Saturday, Nov.4, 8 a.m. to 4 p.m., and Sunday, Nov. 5, 1 to 5 p.m. The last day that the Vote Center will be open before election day is Monday, Nov. 6 from 8 a.m. to 2 p.m.
Absentee ballots that will be mailed must be postmarked by Nov. 6 and must be received by the Board of Elections by Nov. 17. Absentee ballots that are hand delievered to the board office must be received by Nov. 7, no later than 7:30 p.m.
For information about the Vote Center or general questions about voting, contact the board office either online at http://delawareboe.org or call 740-833-2080 to talk to one of the Board of Elections’ staff. This entry was tagged Board of Elections, delaware county, ohio. Bookmark the permalink.